But there’s a caveat for run-ins with brown — or grizzly — bears. 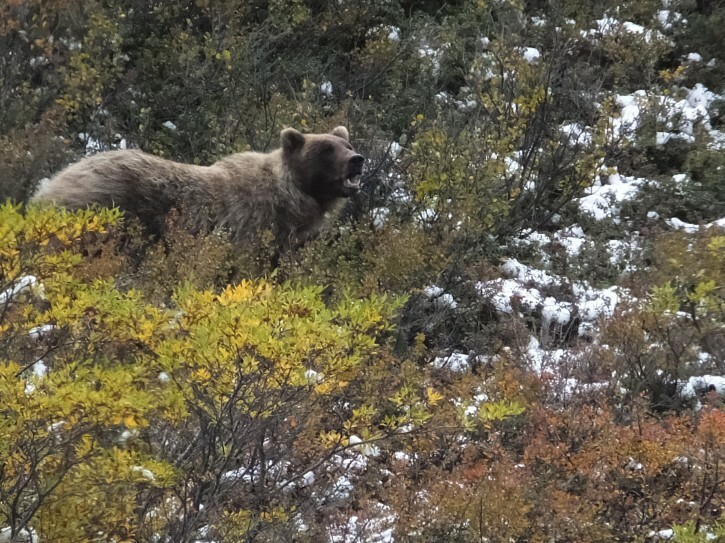 The idea is to play dead only after a brown bear has struck or is about to, not before, wildlife biologist Pat Owen said Tuesday, following an attack on a female hiker last week at Alaska’s Denali National Park. “The right thing to do is not drop until that bear is practically on top of you,” said Owen, who teaches bear safety training at the park. The woman survived, but the Friday bear attack was among the latest in the U.S. Just days before, a man was killed by a grizzly bear while mountain biking near Montana’s Glacier National Park last week. At least three others have been reported this year. Bear attacks are rare, although the chances of being injured by one multiply in the backcountry. For example, 45 people were injured by bears at Yellowstone National Park between 1980 and 2014 out of the nearly 100 million visitors to the park during that time. The 28-year-old woman attacked at Denali was hiking a trail with two friends Friday evening when they saw the bear. Park officials said the bear charged and the three immediately played dead. The bear bit and scratched the woman before walking away. The animal returned a few minutes later and one of the hikers threw rocks at it. Park officials said later playing dead is appropriate when physical contact has happened or is imminent. But done prematurely, Owen said, the bear can grow curious. The problem, Owen said, is the definition of imminent. “Your perception of imminent contact and my perception of imminent contact might be vastly different,” she said. Before the Friday attack at Denali, a large group of park visitors there encountered the same young grizzly. Instead of playing dead, they bunched together, shouting and waving their arms until they scared it off. Park officials say that’s exactly what to do. It’s a good idea to make a lot of noise when traveling through bear territory to avoid the element of surprise, which is behind a good number of bear maulings. Around Alaska, in fact, it’s not unusual to hear hikers and other outdoor enthusiasts repeatedly calling out, “Hey bear!” Some people clap their hands. Some wear bear bells. The idea is to alert bears and avoid creeping up on them. Sows with cubs are especially sensitive to the presence of humans, so make sure you’re never between a mama bear and her young, experts said. Brown bears can be especially dangerous in protecting their young, according to Alaska Department of Fish and Game spokesman Ken Marsh. “Brown bears are particularly aggressive,” he said. Most of the time, nothing is going to happen if people take common precautions, such as traveling in groups, keeping dogs on leashes, carrying bear spray and being aware of their surroundings, notes Montana Fish, Wildlife and Parks spokesman Ron Aasheim. I refuse to go to any of these bear territories no matter how nice the scenery, it 'aint worth it, keep it ! Exactly, that is one of many good reasons to not go to the "country" for the summer. Your chances of getting hit by a bus or killed in a burglary are much higher in the city than getting attacked by a bear in the woods. Must be difficult to let fear run ones life.